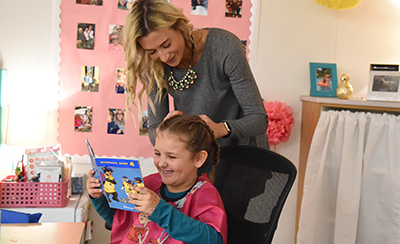 Every Wednesday morning before the first bell rings at Hudson Elementary, the corner of Sarah Shipe’s first-grade classroom is transformed into “Books and Braids” Salon, a warm and inviting “girly-looking” place where girls go to get their hair “done” and read some books, one-on-one with “Sarah,” their hairdresser. Who doesn’t like to have their hair done while reading? Shipe got the idea from a teacher from North Dakota. She found it on Facebook as an article that was reposted about a club with the same name, Books and Braids. To start her club, Shipe created a Google Doc for the teachers at Hudson to fill out, adding the names of girls in first- through fifth-grade who are in need of some TLC or some reading confidence. Shipe then sends the parents an email explaining the program and sets up an “appointment” time with them. The lights are dimmed with only strings of white lights and a couple small lamps in the corner salon. Upright books are displayed on the table in front of the girl, who gets a cape draped over her lap, just like at a regular salon. Shipe asks the girl what music she would like to hear and she selects it on her iPod. “What type of hairstyle would you like today?” Shipe then asks. Once the request is made, the girl then choses a book and begins reading aloud, so Shipe can help her with any difficult words or ask comprehension questions, all while combing and braiding her hair. After the hairstyle is complete, Shipe hands the little girl a big mirror so she can see herself. She usually grins from ear-to-ear and then says, “I love it!” or the big smile sometimes says it all. If time permits, Shipe sits down next to the girl to finish the book and ask how the book pertains to the girl’s life or what she liked about the book. The one-on-one attention from a caring adult is what the girls really seem to soak up. Shipe has had about five different girls make appointments with her so far, but one particular girl comes on a more regular basis. “She is a first-grader who needs a little extra lovin’ and dad is struggling to do her hair the way her mom used to do it,” explained Shipe. Gabriela Arevalo’s mother passed away this past summer, so her dad graciously accepted the offer to have his little girl come to “Sarah’s Salon.” Arevalo excitedly comes in every other week. Gabriela’s mom was Margaret Arevalo, a longtime District employee, who lost her battle with cancer in June. Arevalo was an educator in the Tempe Elementary District for 17 years, first as a dual language teacher, then a classroom teacher, a Title I reading interventionist, and finally as a parent outreach coach. Shipe explained that the girls she has worked with have all had such a positive experience. 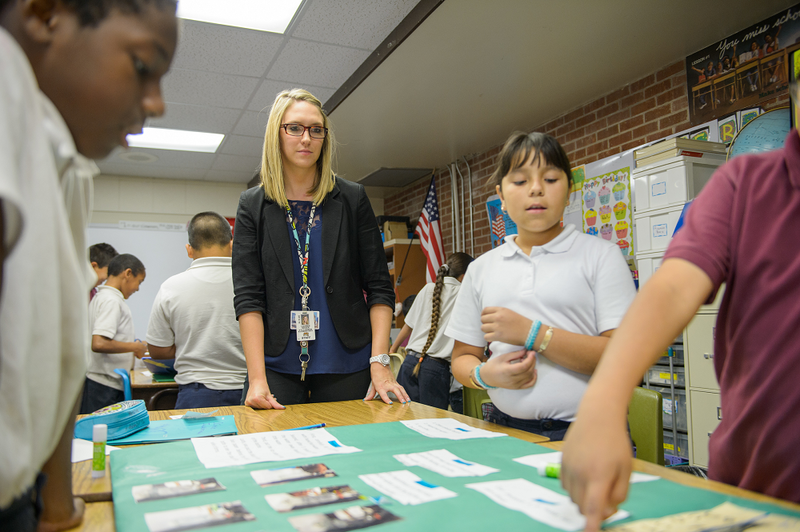 “It makes me so happy to hear from other teachers and instructional assistants that they see what an impact it has on the girls throughout their entire day and even the whole week,” says Shipe. Some say it gives the girls such a confidence booster, something that they have been needing in their reading groups. “It feels good to be making a difference for these girls,” Shipe says. She most definitely will continue “Books and Braids” next year.